The first-grade curriculum begins with typing concepts. It is very important for children to learn to type by fifth grade. Learning to type is all about practice, practice and practice. Your child’s typing success depends on them practicing and typing with the correct fingers and posture. Please make sure your child is logging in on the Portal and practicing typing at least 2-3 times a week. This semester all the projects will be integrated with learning done in their classroom. Science, language arts and math concepts will be project-based. Students will also learn many computer basics by working on simple projects. This is what makes the computer lab fun and engaging. Students will learn how to navigate on a computer, launch a program and save the file during the first semester. They will learn all the basic keys, including space bar, return, delete and shift. Using simple word-processing software, students will write words and graduate to sentences. They will learn a few more tools, like editing font size, color, and style, and the keys undo and redo. We will work on some fun art projects, too. Students will use TUX to create a self portrait. During this semester, the students will also review their internet skills, watching an online safety video before they surf the net. Students will learn to launch the browser, select a favorite, and navigate to various websites for activities on math, language arts and science. By December, the first graders will be confident typists and surfers with a strong sense of computer etiquette. Please contact the Computer Lab instructor, Mr. Richmond, at srichmond@computerwisekids.com if you have any questions about the program. 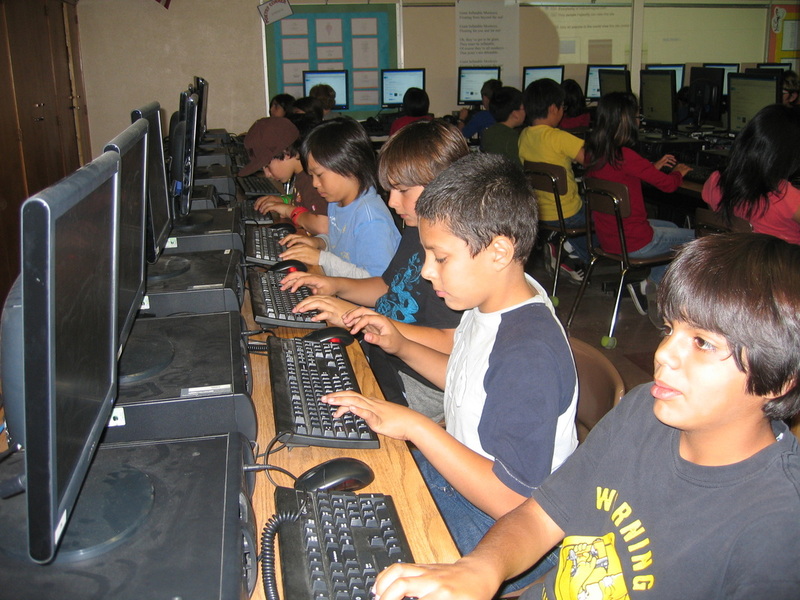 Balboa students prepare for their future in the school's Computer Lab. The Computer Lab's instructor is paid by the Balboa Spirit Club's COMPASS fund. Contribute now to keep our students computer-literate. The student email system. Students in grades 3-5 can email peers within their grade level only. The student projects gallery to view student work. to request the Grade Key and password (don’t forget to mention your child’s name).